As more of you email me photos of projects you have made from my blog, through patterns, tutorials or just quilt inspiration, I thought it would be fun to create a Flickr group where you could post these pictures for everyone to see. I truly enjoy seeing your quilts and projects. I'd love for all of you to join the Fresh Lemons Quilts Flickr group! There are also a few other new groups that you might not know about. 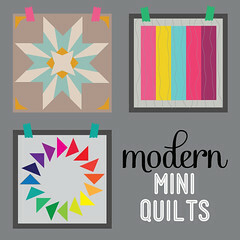 First is the Modern Mini Quilts Flickr group, created by Holly of Bijou Lovely. There's already a lot of inspiration in there. 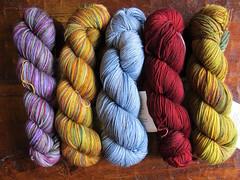 Finally, for the quilters *and* knitters, there is a new group called Purl and Patchwork. A lot of us in this group are new to knitting, and it's a great place to ask all your newbie questions as well as be motivated by what the experienced knitters are creating.